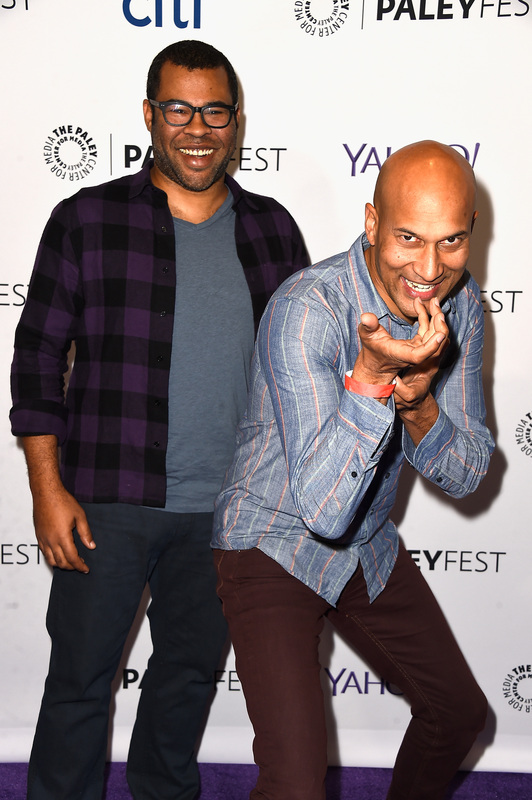 Editor's note: Bustle misreported that Key & Peele was canceled by the network. It was not canceled, but is simply ending. It seems like everyone was disappointed by the recent news that Comedy Central's Key & Peele is ending. How are fans going to get enough of Keegan-Michael Key and Jordan Peele's humor now? The sketch show, currently in the middle of Season 4, is one of the funniest and smartest series on the air right now, especially when it comes to social and political commentary. I can't even tell you how many classic Key & Peele sketches I've shared and posted to my friends in an almost obsessive attempt to get them hooked. It's going to be sad to see the show go. However, it's all going to be okay, I promise! Key & Peele may be ending, but Keegan-Michael Key and Jordan Peele aren't going anywhere. The actors each have several upcoming projects, both together and apart, that should make the grieving process go easier. Ans honestly, the ending of their show, while disappointing, just opens more opportunities for them to take over the comedy world. One potential project that's sure to excite Key & Peele fans? A movie based on substitute teacher Mr. Garvey, one of their best characters from the show. “We’re in negotiations at Paramount to make a ‘Substitute Teacher’ movie,” Keegan-Michael Key told Entertainment Weekly. “Two of our writers are penning it [...] it’s getting there.” Excited for that development? Here are a few more places you can definitely catch your favorite comedians outside of the sketch world in the upcoming months. This is the big one. Jordan Peele, along with Key & Peele and Community writer Alex Rubens, is writing this feature film, which stars Key and Peele as two friends who pretend to be drug dealers in order to save a kidnapped cat. Both comedians are also listed as Executive Producers for the reboot/continuation of the 1984 film Police Academy and franchise (see above), along with The Mindy Project's Ike Barinholtz. While they may not star in it, the reboot will be better off with their comedic voices behind the camera, for sure. The companion parody to Hulu's Hotwives of Orlando will feature Keegan-Michael Key as the Mayor of the Vegas Strip. He'll join the original cast, which includes Casey Wilson, Tymberlee Hill, and Angela Kinsey. You can also find Keegan-Michael Key on the upcoming season of Playing Houseon USA and in films including Vacation, Welcome to Happiness and Kitchen Sink. Amidst the many celebrity and comedian cameos in the Netflix prequel to the cult camp film is Jordan Peele as Alan, who you can catch a quick (and super smooth) glimpse of in the trailer above. Finally, Key will voice the character "Murray" in Hotel Transylvania 2 and will be in the Angry Birds movie, whereas Peele can be heard in the upcoming Captain Underpants movie. See? There's so much to look forward to from the duo. Maybe the show's ending isn't so bad after all.